First a brief word about what Python is and why it is a adequate tool for analysing scientific data. Python is a very powerful dynamic object oriented programming language. It is the engine which drives some of your favourite tools; for example Sublime Text, Blender, and even parts of Google and Youtube. Modularity allows Python to be used in Web Programming, GUI Development, Software Development, System Administration and of course Scientific and Numerical Computation. The specific Python modules we are interested in today are called Numpy, SciPy, Matplotlib, and Pandas. They transform Python from being just a great programming language to being a data-analysis powerhouse comparable to Matlab. The shortcuts behind the as can now be used instead of the module name (for example: np.array). The shortcuts I chose are kind of a guideline for these modules, hence I would suggest you to use the same. Now you are set up with a running Python installation and a Ipython console, where you can type in all the examples I show below. Just keep in mind, you have to type in these import statements whenever you start a new console or script. If you have any problems setting everything up, feel free to comment down below or to contact me any other way. Let’s talk about what the before mentioned modules offer us! The Numpy package is the basically the main module you will use when doing math or more specific matrix based computation in Python. By the way “matrix” in this context includes any kind of numerical data which can be expressed in a grid, like a set of spectra or stock data. What we have done, is defining a variable mylist and setting its value to a list with three elements (1: [1,2,3]; 2:[4,5,6]; 3: [7,8,9]), which each consist of three elements on their own. If we use the print() function to write the value of our variable on to the screen, the output looks exactly the same like our input. The output of this print statement is now formatted like a matrix and we can do “matrix-stuff” with our array variable. Be aware, that array * array is not a matrix multiplication in the mathematical sense. By using “ * “ the matrices get multiplied element wise. To make mathematical matrix multiplication use the dot-product. Go ahead and try out both to understand the difference! A short word about comments in Python: Whenever you want to write a command inside one of your scripts you use a “#”. Everything after this symbol in the same line gets ignored by Python. Usually a comment is used to provide additional information about what a certain part of your script does. Therefore, use them extensively to make everything easy to read and understand. Note the parentheses at the end of the last three examples. These are necessary, because sum or flatten are no attributes of the array, like its size, but rather functions you can apply to the array. Inside these parentheses you can pass additional arguments to the function if needed. But even if you don’t pass any arguments the empty parentheses must be there! Try out these examples on your own and than call print(array) again. You will see, that the value of array has not changed, despite we have performed all these actions on it. To save the output of one of these functions you have to assign it to a new variable or override your old array. This will assign the third line of array to the new sub_array variable. Yeah, your read right! The third line and not - as you may expected - the second. This is a import thing to keep in mind: Counting in Python always start with 0. So the first element of anything countable has always the index 0 (array); the last element has the index -1. Let’s take it to the next dimension (two to begin with). Selecting a single element in a 2D matrix can be done by specifying the row and the col index separated by a comma. But this is not limited to selecting a single element. You can easily select multiple elements of your multi-dimensional array using the syntax learned from the first examples. Really try to understand how array slicing works! It can greatly boost your productivity when working with complex data. The additional parentheses in the first example are no typos. For this specific function the shape of the array must be passed as a tuple-object (inside additional parentheses). However, in the second example we could pass the different dimensions one by one. These small differences in the syntax can be very frustrating at first. Therefore, when ever a function does not behave like you would expect, check its documentation page. Regarding numpy an explanation for every single function can be found on http://docs.scipy.org/doc/numpy/. A nice Spyder specific trick is to use the build-in object inspector (top right panel). Press “Ctrl + i” over a function name or go to Tools/Preferences/Object inspector and activate “Automatic connection” for the script editor and the Ipython console to display the documentation of a function while you are typing. Of course, if you want to analyse something you need a way to import your data. This is what we ganna talk about in this section. Assuming you don’t have time to type in all your data by hand, the best way to import it is by using the csv data format. CSV means “Comma separated value” and is basically a textfile containing all your data points separated by commas and line-breaks. If your specific dataset is not using a comma as separator, don’t worry! You can configure the csv importer to work with any separative character you desire. So how to actually do it. Numpy provides a very simple to use function called loadtxt, which can load any raw-text datafile and outputs it as a numpy array. To specify your separator use delimiter parameter. Before you ask: You can get the current working directory of your Ipython console by using import os; print(os.getcwd()) and change your working directory by selecting a folder in Spyder`s file explorer (third tab of the top right panel) and afterwards pressing the funny colourful button in the very top right of the Spyder window with the small red arrow pointing at a python symbol. column_1, column_2, column_3 = np.loadtxt("path/to/my/data/data.txt", unpack=True) # load a file column-wise into separated variables. As you may noticed I recently wrote a blogpost, explicitly telling you to stop using numpy loadtxt. I still believe that numpy loadtxt is a bad choice, when trying to do time-efficient computing with large sets of data; but to get you started in the fantastic world of scientific Python it’s absolutely appropriate to use it. As its name has maybe already gave away, we will talk about the matplotlib library in this section. Maybe you were confused earlier on when we imported matplotlib.pyplot instead of simply matplotlib. The pyplot module is part of the matplotlib package and contains all the stuff we need to make beautiful 2D plots (lines, bars, colourmaps, …). If you want to make more crazy stuff, like 3D plots or simple animation stuff, you need to import other modules of the matplotlib package. But for now, we gonna focus on the 2D library. Keep in mind we imported matplotlib.pyplot as plt! Yeah! A line! Let’s break down what happened. First we “generated” some data. This data doesn’t have to be a numpy array; a simple list of integers or floats will work, too. After this, we plot the data using the plt.plot() function. Depending on how many parameters you pass to the function it changes its behaviour. Passing only one parameter, its value is taken as the y-data. Passing two arguments, the first is used as the x-data and the second as the y-data. You can further use an optional third parameter to specify the plot colour and the shape of the markers. To get all the possible values for this optional parameter check the documentation. Before we proceed, I want to say a few words about this last line of the plotting example. If your remove the plt.show() and run the code again, it will probably still work. 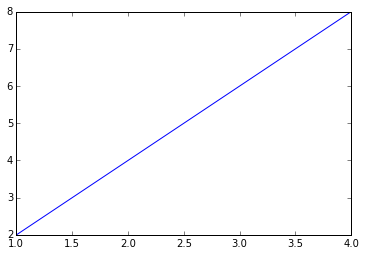 This is, because inside an Ipython console the interactive plotting mode of matplotlib is on by default. This means, that every plot command you type directly results in figure. This allows you to interactively interact (silly phrase…) with your plot, since every command directly updates the figure. However, when you creating a complex plot using a script, you should have turned this mode off to prevent some issues. To turn the mode on or off use plt.ion() and plt.ioff(), respectively. This is also a good time to talk about “backends”. 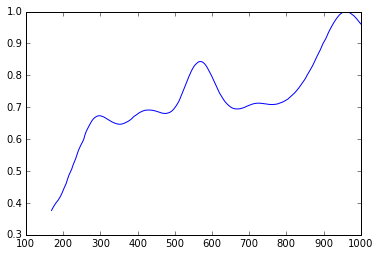 A backend is basically what matplotlib does after it has calculated how the plot is gonna look like. There are graphical backends, which result in a graphical representation of the plot and there are non-graphical backends, which can be used to store the plot in a certain format. Usually you don’t need to mess around with this. The reason, why I’m bringing it up here is, because Ipython adds another very special backend to the equation: the inline plot. This backend only works inside of an Ipython console and results in plots drawn directly to the console window. To activate it type %matplotlib inline; to change back to a secondary window for displaying your plots type %matplotlib qt. If you are not sure which backend you are using, just try out both and see the difference; when the qt backend is selected the plot may be displayed in a minimized window. So check your taskbar! Ok, we got enough basics to handle some real life data! To follow along, get the spectral data from this github-repo. The file consists of two columns. However, only the second column contains relevant data. Our goal is to clean the data and to visualize it. Because we want to do some real work and not just playing around with the data, it is appropriate to write a real reusable script. Hence, create a new empty script in Spyder and save it in the same folder as the spectral data. You can press F5 to run the script and see its output inside our ipython console. I would also recommend using the variable explorer after each run to check if everything went as expected. We are just using numpy’s loadtext function with its unpack parameter. This allows us to parse the second column to our data variable and the first to the underscore variable. You could have named this variable what ever you want, but “_” or names starting with a “_” don’t show up in spyder’s variable explorer by default; using them, keeps everything a little bit cleaner. Now we have to normalise the data. This means we want to define each point relative to the maxima of the spectra. Therefore, we have to divide each data-point by the maxima’s value. We can get the maxima using the max() function. Then, we can simply divide our array by this scalar. To create appropriate x-values we have to know what our x-axes actually represents. Let’s assume, our spectral data was recorded with wavelengths in a range from 100 - 1000 nm. Now we can use np.linspace to create a new array. We gonna use 250 points to match the length of our data array. Because we are only interested (just for the purposes of this tutorial) in the data from index 20 upwards, we have to cut of these first 19 datapoints utilizing the power of array slicing. Last thing to do is plotting the data. If something went wrong, check with my code on Github. Not particular pretty, but that’s all for now. We will start of the next part of this tutorial series by getting into more advanced matplotlib stuff, so we can improve the appearance of this plot. If there are any problems, or you have specific topics you want me to cover, feel free to comment down below or contact me in any other way.